so here is a little tip to save you money and save the environment at the same time. 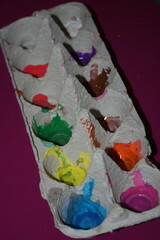 Instead of buying the plastic cups for paint, use an egg carton instead. I cut it in half and use the bottom part as a paint holder. I reuse it as much as possible.